Sometimes the most elegant solutions are also the simplest ones. 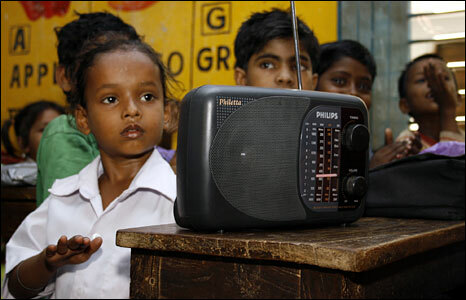 I was reading about a fantastic radio program in the Indian State of Bihar that aims to provide basic English language to primary school students in a bid to improve the literacy levels from the current 47% to the national average of nearly 65%. The program called “English is fun’ is broadcast in half-hour segments, four days a week, and reaches seven million students attending 65,000 primary schools in all the 38 districts of the state. According to the BBC, the state government is encouraged by the positive response from the kids and teachers, and has decided to take the program a step further and set up independent community radio stations at some schools for broadcasting lessons. The Bihar Education Project is a collaboration with a US-based organisation, the Education Development Center, and the US Agency for International Development (USAID) to boost primary education in the country.